Erick De La Vega is a fine artist, photographer, and make-up FX artist. Concentrating primarily on his special effects work for the past 18 years, Erick has a host of project credits under his belt throughout the film and television industry (Thor, Real Steal, Cowboys and Aliens, Buffy the Vampire Slayer TV series, Angel TV series, Jeepers Creepers, Blade II, and Batman Dead End). His fine art paintings draw upon that work experience and showcase the ease of realism he achieves with airbrushed acrylics. 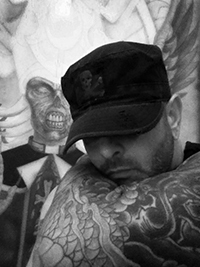 Trained at the New World School of the Arts and the Art Institute of Pittsburgh, Erick's work is influenced by the modern masters of dark, fantasy art like Frank Frazetta, Wayne Barlow, and H.R. Giger, as well as a mixture of his own Catholic upbringing and his obsession with Demons and the undead. Erick De La Vega's painted creations are otherworldly and yet eerily familiar. They expose the viewer to a horrific beauty that potentially awaits at the end of every darkened passageway. They are fearsomely compelling.